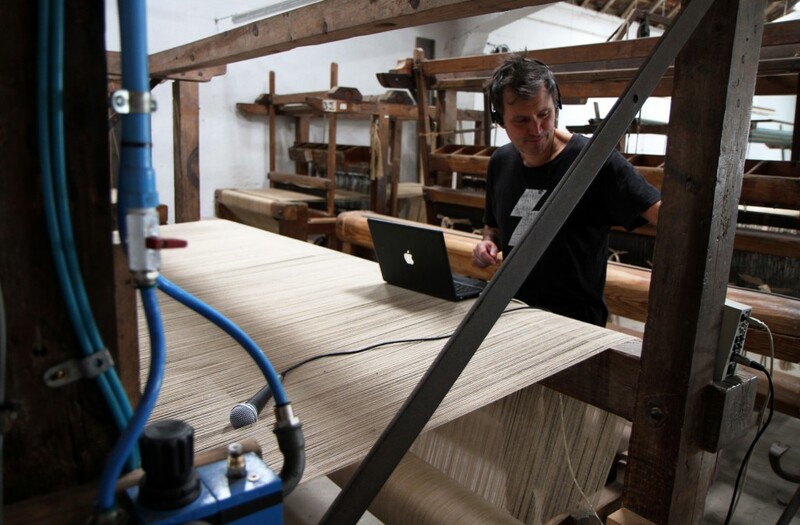 For this collaboration, between textile designer CAVALCANTI and electronic music and art outfit Noise of Art, Ben Osborne uses a textile factory in Portugal as an instrument, creating electronic music out of the sounds of looms and tufting machines making CAVALCANTI’s specifically designed rugs. The design of the textiles are then also translated into digital signals and patched through synths, to create other-worldly melodies and baselines. ‘Comfortably Spun’ turns the weaving and tufting techniques used in the textile industry into music. The sounds and rhythms of the looms and tufting tools have been recorded and arranged into contemporary electronic tracks, using techniques from early electronic ‘tape” music. To complete the creative loop, the designs of the rugs have been digitally mapped into synthesiser patterns, adding melody to the rhythms of the factory. On Friday 18 March the AV installation will be joined by live sets from White Noise – the band behind the UK’s first electronic LP in 1969, live electronic improvisors, The Deben Collectove and DJ sets from Horton Jupiter and Ben Osborne. “When it comes to mega multimedia events, Ben Osborne and his collective, Noise of Art, are all over it.” (Time Out London).